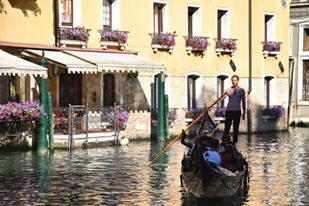 We started our last day in Venice by catching the Vesporetto around to the Frontier Police to check out of Italy. Good to get this one out of the way early. Then we set about seeing what remained on our To Do list. We loved just walking around Venice, checking out all the nooks and crannies. My phone told me we did a couple of 14km days. We wandered up a great shopping street just north of the Grande Canal and ducked in to see the Church of Madonna dell’Orto. The churches of Venice are pretty damn impressive. Then down to the long street again to see some of the impressive palaces on the Grande Canal. We found a nice nook and stopped for a pizza and some wine, before heading to the Rialto Bridge via some more interesting streets. We crossed the bridge and headed for the Santa Maria Gloriosa del Frari. As we got closer the rain started coming down in buckets and we retreated to a café for wine and cappuccino. Two drinks later, the rain abated and we made it to the church (on time). Its spectacular in its shear size and its marvellous paintings, sculptures and its pretty cool altarpiece by some dude called Titian. What caught our eye was a sculpture depicting black slaves, a quite haunting commentary on the wrongs of slavery. Good on the old Franciscan monks for taking a stand a long time ago because slavery was something the Venetians of old used to trade in. We were on a roll and the last stop of the day was the Ca’ Rezzonico, a beautiful palace on the Grand Canal from the 1800’s. It’s an interesting look into what living in a grand Venetian home was like in the last days of the grand Republic, decked out with 18th century furnishings and paintings. Then it was off to Harry’s Bar. Unfortunately it had just ticked over 6pm so my shorts were a problem. So back to the boat for a shower and a change. Whilst on the Island of San Georgio we checked out the impressive yacht club we were staying at but unfortunately the season was a few weeks off and the weather was bad so the bar and restaurant was deserted. Not to worry, they had another club restaurant on the main island, just off St Marks square with an amazing view back to San Georgio. This was the site of their original yacht club and we had a great 5 star dinner there for about a third of the price of the other restaurants huddled around St Marks. Afterwards we walked around to Harry’s Bar but it was closed. Never mind, it was getting late and we headed back to the boat for our early morning departure back to Pula in Croatia. This entry was posted in Italy and tagged venice by stull61. Bookmark the permalink.